Food Costs > How Much Does a Cucumber Cost? How Much Does a Cucumber Cost? A cucumber, a vegetable that belongs to the gourd family, grows from vines and is usually large and cylindrical in shape. While there are many health advantages to eating a cucumber, there are physical advantages as well. For example, a cucumber can restore your skin to its natural glow and can maintain good vision. The cost of a cucumber will depend on the type, time of year, where you live and where you purchase it. Seedless long cucumbers, for example, will cost around $0.75 to $1.25 each, while a Kirby can be $0.50 to $1.75 per pound. A Persian cucumber can cost $1.50 to $2.25 per pound. At Trader Joe’s, for example, a 16-ounce package of five to six cucumbers retail for a pinch more than $2. Organic cucumbers are going to cost the most, usually around $1.50 to $2 per pound. Baby cucumbers can cost closer to $3 per pound. However, most cucumbers found in the grocery store should cost $0.30 to $2 each. According to KayCircle.com, cucumber costs are going to be anywhere from as little as $0.30 to as much as $1 per cucumber. Many people state that cucumbers from Asian countries are much cheaper than western cucumbers. This USDA report, as of 2013, claimed the average price of a cucumber was $1.30 per pound or $0.35 per cup. The size of a cucumber may affect the price. If the grocery store, while rare, is going to charge by the pound, the size will increase the price. However, most are going to charge by the cucumber, rather than by the pound. The type of cucumber as well as whether or not it is organic or not can make the price higher or lower. Most vegetables are going to vary in pricing depending on the time of the year. While cucumbers tend to stay under $1, they can be a tad higher during the colder months. Cucumbers can be used to lessen the effects of aging skin. Apply it to wrinkles, dark spots, or cellulite and it can make them less evident. Eating half a cucumber before bed is said to replenish the nutrients you may have lost after a long stressful day or after a long hard workout. An unpeeled cucumber can be used to rub out marks from pens or crayons on surfaces. Holding a slice of cucumber on the roof of your mouth for 30 seconds can eliminate bad breath. If you need energy, grab a cucumber instead of a coffee. It can give you just the right amount of energy that you need. Slices of cucumbers can be used to shine your shoes. Just need a few slices and some water! Place cucumber slices throughout your garden to repel pests. 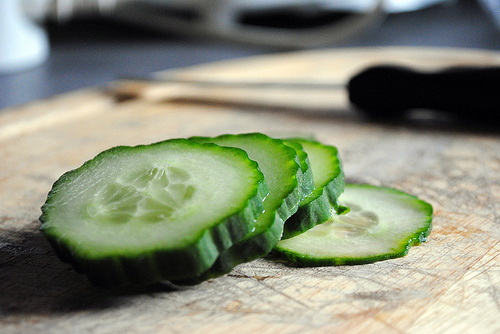 Cucumber slices can be used to soothe a sunburn. Before buying a cucumber, you need to look at its color first to determine if it is still fresh. If it is green, then it’s safe to say it is still fresh. Store your cucumbers in a cool place, such as refrigerator, to prevent it from drying out. Cucumbers are part of the same family such as squash, muskmelons, watermelons, and gourds. This plant can produce male and female flowers on the same plant; however, newer hybrid plants only produce the female flower. Today, the United States has more than 97,000 acres of cucumbers, with a value of more than $180 million. For the best taste, cucumbers will taste best when they are one to two inches in diameter and at least six inches in length. To ensure that the product is going to be tasting great, always choose one by its size. Also, you should check closely for damage. A good cucumber will last up to 14 days once it has been harvested. If purchased from a grocery store, assume that it has already been picked for three to five days, so it is best to use it within one week. Check out a local farmer’s market. Local markets will not only supply fresher products, but they often tend to be a lot cheaper than the local grocery store. Keep your eyes peeled for local sales. Many grocery stores can run deals such as three for $1. If you have a green thumb, consider growing your cucumbers for a lot less than buying at the store. For example, a pack of 10 seeds can cost less than $1.